Ah, spring cleaning: the most daunting of seasonal rituals. Scouring the bathroom tiles and organizing your closet may be a drag, but if you stay on top of your weekly and monthly chores, keeping your home fresh and tidy will be a much more manageable feat. Here's how often you should tackle 12 household tasks. Many people think the heat in the microwave will kill all the germs and bacteria in the food you're heating, but this isn't the case, says Sam Mitrovic, founder of the cleaning service Uber Clean House in Melbourne, Australia. "It's important to properly clean your microwave at least once a week," Mitrovic recommends. Do this by microwaving a large cup of water, vinegar, and a chopped-up lemon until the solution boils and steams the window. You should wipe down the hood as part of your daily kitchen routine, says Harriet Jones, cleaning supervisor with Go Cleaners London. "However, you can clean the filter monthly—the more frequently you clean the filter, the easier it will be," Jones says. Sweat, dust mites, and dirt accumulate very quickly, especially since you're typically lying on those sheets for eight hours every night, says Becky Rapinchuk, author of Simply Clean and blogger at CleanMama.net. The sheets should be washed using hot water (130 to 150°F) and a hot dryer cycle to kill the germs. It's important to inspect and clean the vents—and replace them if necessary—because they accumulate lint that is highly flammable and can cause a fire, Jones says. Depending on the number of people in your family and the dryer's use, you may need to do this more frequently than once per year. Your pillowcases put a barrier between you and your pillows, but they still collect sweat, saliva, and other body fluids, says Nic Croughan, interiors expert at Custom Curtains in the United Kingdom. Wash instructions will vary by pillow (depending on if it is down, synthetic, or memory foam), so check the manufacturer's recommendation before throwing in the washing machine or dryer. To avoid moldy food build-up (and so you don't completely forget what's in there), it's important to give your fridge the attention it deserves, says Tova Weinstock, a professional organizer and cleaning enthusiast based in Brooklyn. "Also, fridges get dirty from spills, loose food particles, and even dust," Weinstock says. Wooden and Venetian blinds require a weekly dusting, while fabric curtains can get away with being washed annually—the exception being if your window dressing is in a particularly damp space, such as in the bathroom or above a sink. Then you'll need to clean it more often, advises Croughan. "We recommend using steam as an effective cleaning method, and if your curtains are very expensive, turn to a professional," Croughan says. Accumulated grease and grime over time will cause the oven to use more power when it's turned on, which will lead to higher bills, says Lauren Haynes, cleaning expert with Star Domestic Cleaners. It can also ruin the taste of the food, she says. After drying off, it's best to leave your towel in a well-ventilated place so that it can air-dry completely, Jones says. This will keep the bacteria at bay for a couple uses—but then it's time to throw your towel in the wash. It's estimated that there are nearly 50 bacteria per square inch on the seat of the toilet, Jones says. To deep clean your toilet, cleaning expert Leslie Reichert tells TODAY that you should turn off the water to your toilet and give it a flush to completely empty the bowl of water. Then sprinkle a homemade baking soda-based cleaning solution (or a store-bought toilet cleaner) into the toilet bowl and give it a good scrub with a sponge (while wearing gloves, of course!). Then add a cup of distilled white vinegar and allow to sit for one hour. Dust, pollen, and other allergens can block the vents, according to Jones. "If you have any refurbishment work done, you definitely need to clean, or at least inspect, the vents, as construction work spreads sawdust throughout the house, which can cause increased suffering of people with allergies or asthma," she says. 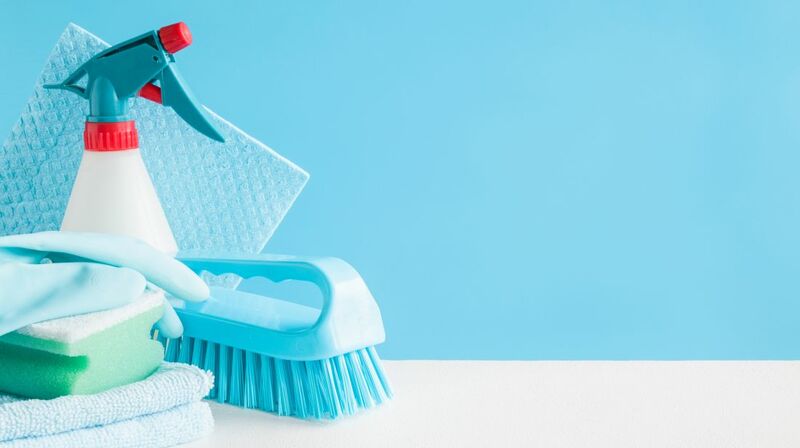 "Along with brightening its appearance, regular cleaning will eliminate bacteria rooted deep in the furniture's fibers and leave your couch smelling fresh," Jones says. "Cleaning your upholstery will also reflect on the air quality and will reduce the risk of mold and mildew growing." If it's been awhile since you've had your upholstered furniture cleaned (or if you never have), it might be worth investing in a professional cleaning.